Everything is still gloomy and inflicts despair. At least, we do NOT get to see Yhwach’s face, because I really am annoyed with this antagonist. Then again, there still is no light of hope in sight. 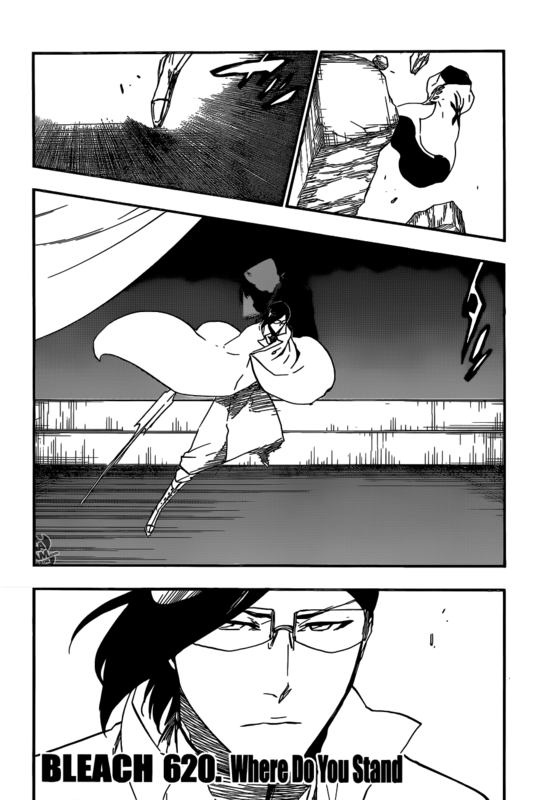 Although, in the last page, we see Sōsuke Aizen, which I really do not trust. I mean, he had evil intentions before, how can you trust him? But you have to admit, he really is powerful and gifted; I just wonder if he can match up to Yhwach. So, when Yhwach said he was going to take what belonged to the Soul King in the last chapter, he meant to absorb the Soul King’s powers. Apparently, he also absorbed Mimihagi, The Right Hand of the Soul King. And as Yhwach is dissolved into these powers, small, black, one-eyed creatures start multiplying and go down to Seireitei and attack the Shinigami. One of Yhwach’s henchmen explain that these creatures, which manifest the freed full power of the Soul King, have now become enemies of the Shinigami. This got me thinking, if Yhwach takes over, does that mean that the Zero Division / Ichibē Hyōsube will adhere to Yhwach and become enemies of the Shinigami in Seireitei? I mean, the Zero Division is supposed to protect the Soul King and the Soul Family, right? That is, assuming that the Zero Division has not really been eliminated. Finally! 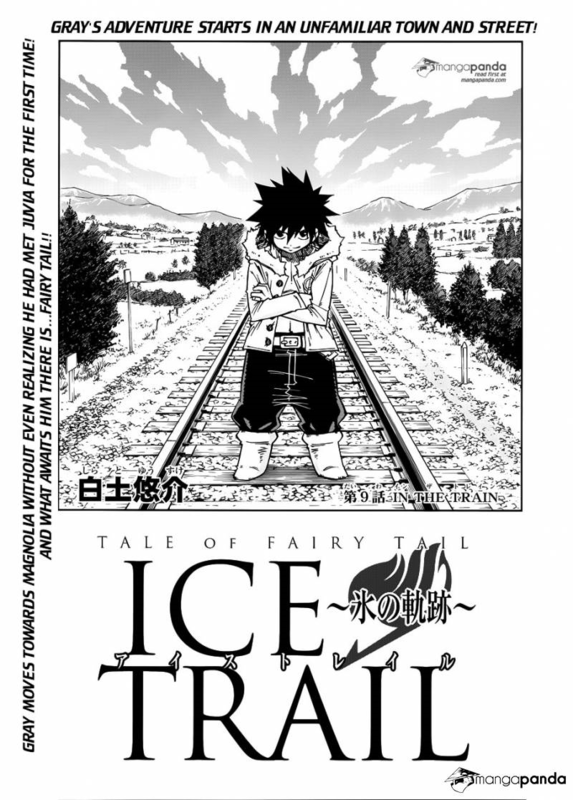 This is one of those chapters where we say, “Now, we’re on to something!” When Natsu Dragneel visits the Sabretooth guild and goes looking for Rogue Cheney and says that he must not trust Gray Fullbuster at this time, I was brought back to the Dragon King Festival / Future Rogue arc. Just to refresh your memory, when Natsu beat the Future Rogue in chapters 336 to 337, Future Rogue forewarns Natsu to tell him in one year’s time to protect Frosch. Back then, I kept wondering how Frosch will die / died. Now, one year after Fairy Tail’s disbandment, Natsu’s eagerness to meet Rogue and his resolve to bring back Gray says it all: Frosch will/might get killed by Gray. Definitely, “We’re on to something!” Things are really getting exciting with a tinge of foreboding. I do hope Rogue does not do anything stupid and follow Natsu to where the Avatar guild is. Then again, can destiny be changed? I think Natsu, Happy, and Lucy are not enough to bring down the Avatar guild. With that, I believe they will encounter other Fairy Tail members before facing off with Avatar. Also, is it possible that Gray knows about E.N.D.? Is E.N.D. really connected to Natsu? I love “history of…” / back stories / origin stories like this. The reason for that is not because it provides an in-depth understanding of a protagonist’s current behavior and development; we already know of these details as the canon story progresses. Rather, it is because I love to see characters that have become part of the protagonist’s life. With that, I then wonder and look back on whether or not I have come across these characters from the past in the current/canon storyline. So, the first character we meet is Pause Lightless. Yes, a very unusual name, indeed! Nonetheless, Pause seems like a nice name; I might consider it for my kid’s name in the future. I actual like this character; he is more like me, I believe. He is low-key, reserved, quiet, kind, and friendly. But, once he gets annoyed, irked, pissed off / angry… holy crap! He loses it! He turns into the Incredible Hulk! Also, I like his magic, although I do not know what it is called. Book Magic? Paper Magic? Maybe even Wind Magic or Air Magic. Nevertheless, it is really nice: book pages twirling into a tornado that attacks enemies. Add his rampaging attitude, and you have got yourself a monster! 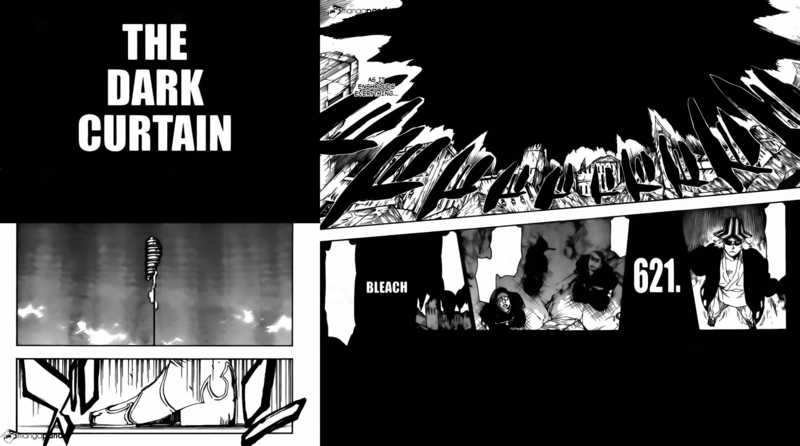 This chapter of Bleach is one that focuses on a specific moment, making it seem like a slow story progression. However, with the action sequences, it would seem fast-paced. Also, this is another of those chapters that are not really encouraging; it was really depressing. Uryū is still fighting his friends, like he has truly become one of Yhwach’s henchmen. Yoruichi Shihōin is still not visible here; I do hope she is fine. Overall, it is just one of those Bleach chapters wherein the bad guys seem to win and you just go, “Ugh!” Plus, considering that Yhwach is crazy powerful, and also, recalling Ichibē Hyōsube’s statement that they “cannot win”, it would seem that the world really will end. I mean, Ichigo Kurosaki does not have power to go up against Yhwach, does he? That was actually well-established when Ichibē could not defeat Yhwach. So, what now? You might as well end the series on a depressing note. Chapter Disappointment: Uryū still siding with Yhwach; and Yhwach absorbing Mimihagi and is about to take everything that “belonged” (past tense) to the Soul King. The elite Sternritter are well and fully powered. Chapter Approval: None. Another chapter of despair. 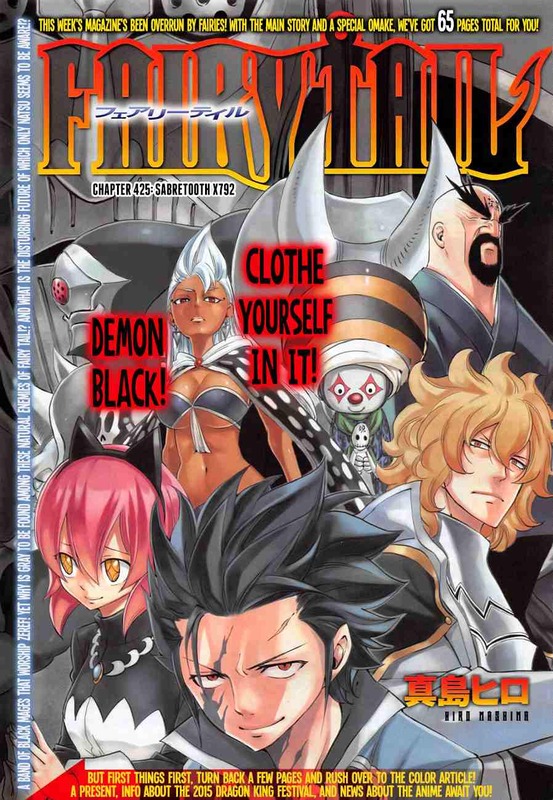 Chapter Cliffhanger: Where is Yoruichi Shihōin? What happened to Ichigo and everyone else? And what happened to Jūshirō Ukitake after what happened to Mimihagi? And, will somebody, please, pretty please stop Yhwach and his plans, if ever that is possible? So, the eighth season of The Voice (U.S.) is now in full swing. Going through the performances on YouTube, one of the Blind Auditions that caught my attention is the one by Rob Taylor. That is one crazy reinforced falsetto! I cannot even reach that pitch! (I can only reach an octave below that in a light falsetto.) Truly an admirable vocal ability. No wonder Christina Aguilera wanted to exert that Rob should choose her team. And I love that way that Christina did that. Ha! Ha! With this song stuck in my head, I thought of searching for it on YouTube, if the original key really is like that (with the falsetto and all). I was able to find the original music video and discovered who the original singer is: Luke James, a singer-songwriter.